Following record-shattering employer participation in ESGR Signing Ceremonies at the Pentagon in 2015 and 2016, FASTPORT coordinated with industry leading employers from around the country this year in multiple industries to display their continued dedication to our nation’s heroes and to publicly affirm that they are ready and able to stand as First Responders in military employment. Executive Director of ESGR CAPT Juliet Perkins, said “This [event] is tremendous. If you are partnered with FASTPORT, you know their mission to eliminate unemployment and underemployment for our military community. You know your own missions. If you’re going to partner with an organization, it’s important to know what their mission is, and our mission at ESGR is to ensure a great cohesive relationship between employers and our service members who deploy. 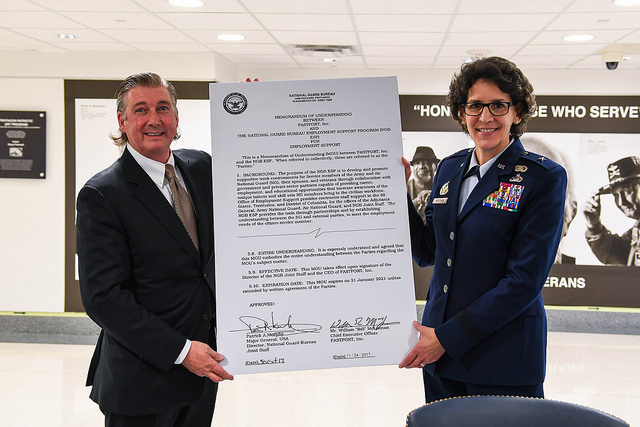 FASTPORT CEO Bill McLennan and Brigadier General Meyeraan hold ceremonial MOU document detailing the partnership between FASTPORT and the National Guard. Before the Statement of Support Signing Ceremony took place, the National Guard Bureau and FASTPORT announced their signed Memorandum of Understanding (MOU) that will help Guardsmen find great employment opportunities in the civilian sector. After the MOU announcement, employers stepped up, one by one, to sign publicly sign their Statements of Support and display their leadership for employing members of the Guard and Reserve. To learn more about how you can sign your own ESGR Statement of Support or begin your own military hiring program, visit https://www.fastport.com/employers/.